I recently spent four weeks in London with some lovely relatives from my mother’s side, who graciously and warmly accepted me into their home at the end of my first solo holiday overseas. After two months of being fed a rotation of comforting albeit incredibly salty and indulgent camp food in Canada, I was grateful for the abundance of fresh produce and deliciously healthy meals that my family whipped up each day. I realised I was busting to get back into the kitchen and have some control over my diet again, both to ensure I was eating from all five food groups (welcome back into my life vegetables! ), but also so that I could indulge in my obsession with baking after a painful separation from the mix master! And so, plans started early on for the creation of my cousin’s birthday cake. I became consumed by thoughts of creaming butter and sugar into pale, golden peaks, folding soft mascarpone into whipped cream and watching a dark cake grandly rise upwards in the glow of a warm oven… I not-so-inconspicuously sussed that a Black Forest Cake, minus the child-unfriendly liqueur, would be received most favourably. 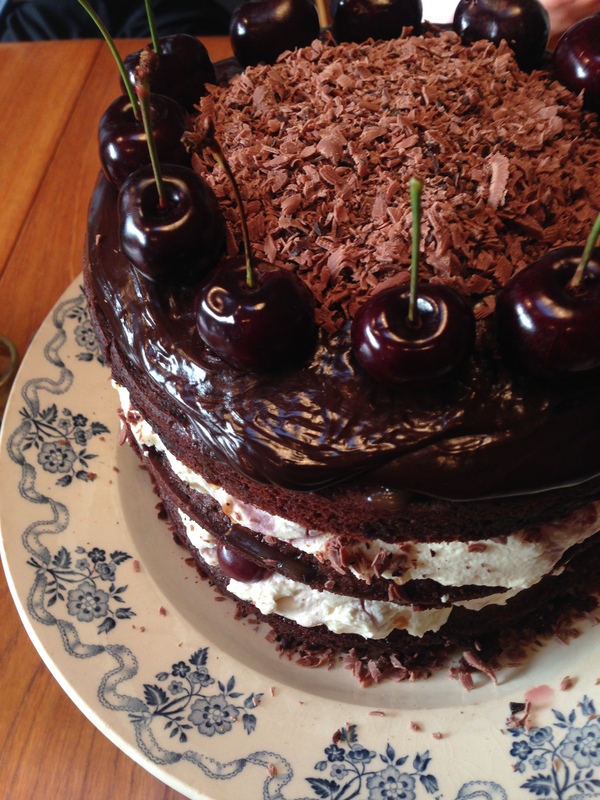 And so I set about hunting down the perfect recipe, until I stumbled across a stunner at http://www.bbcgoodfood.com/recipes/2303676/black-forest-gteau . I decided to use the marscapone frosting I found on Linda Lomelino’s blog Call me Cupcake, found here; http://call-me-cupcake.blogspot.com.au/2014/08/black-forest-gateau.html#.VD0YBvmSy2l. Linda’s gloriously constructed ‘gâteau’ was the inspiration for my presentation, as there are few things I love more than a dramatically high cake that somehow retains its modesty and elegance. I prepared the cakes the day before assembling this beauty, and left them overnight to soak up the cherry syrup I had drizzled them with. They were very soft and sticky in the morning, almost worryingly so, but they held together enough for easy assembly of the layers, and their sponginess made for a smooth, velvety textured cake overall. I found that leaving the cake batter in the tins for half an hour before baking made for a more even rise, as allowing the melted chocolate and butter in the mixture to cool slightly before baking seemed to give the uncooked cake more stability. 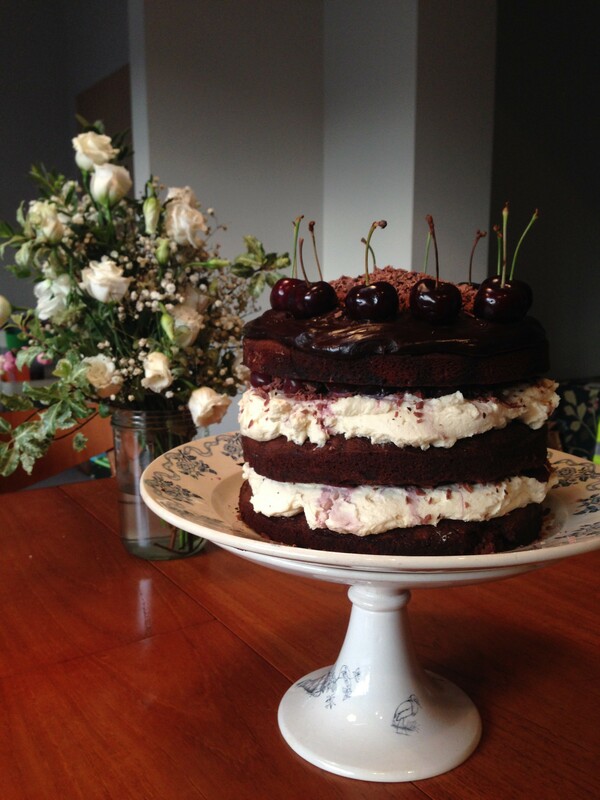 Between each layer of cake and mascarpone frosting, a spread a generous sprinkle of grated milk chocolate and a heaping of cherries and syrup. Don’t hold back with the syrup, as it adds beautiful colour to the cream when it seeps down the sides of the cake. Allow the chocolate ganache to cool until only just warm before spreading it atop the cake. It should be so thick that it barely moves when tipped onto the surface, allowing controlled spreading with a knife for an even, thick layer. Decorate the surface of the cake as you like, I took Linda’s cue of surrounding a heaped pile of grated milk chocolate with a border of fresh whole cherries.